Do you remember turning 13: the anticipation, angst and joy of wanting to ‘fit in’ and ‘stand out’? On January 25-27, Mount Madonna School (MMS) will present its high school production of 13, a story about growing up and finding one’s place in the world. The story concerns young Evan Goldman, about to turn thirteen, suddenly swept from his comfortable New York City life to a Midwest town following his parents’ divorce. In his subsequent search for enough “cool” kids to attend his Bar Mitzvah, Evan faces important decisions about what he is willing to sacrifice to gain popularity. On January 25 at 7:00pm, and January 26-27 at 2:00pm, students will take the stage for performances at the Mount Madonna’s Hawks’ Nest Theater. Tickets are on sale now at mms-13.brownpapertickets.com. Adults are $15; 18 and under are $10. All seats are reserved. “Directors of young adult theatre are often faced with selecting plays filled with characters far from the age of their students or set in historical or vastly different realities,” commented Director Sampad Kachuck. “In selecting a play for our students to perform this year, the directing team wanted a play that spoke directly to our students’ experiences of growing up. 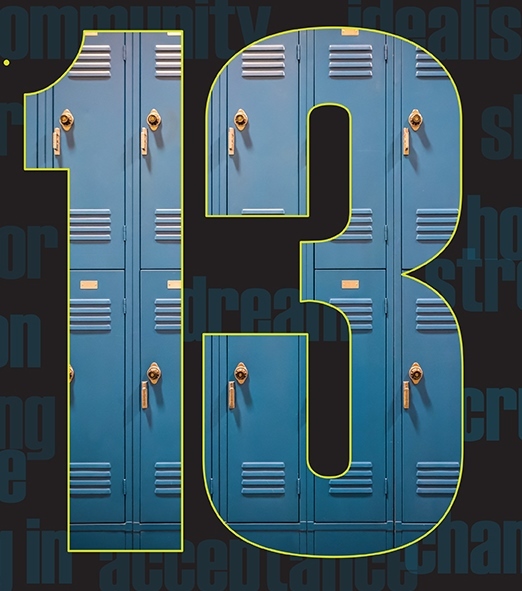 13 is brassy and broadly written, filled with kids far from perfect, behaving in ways that although recognizable, are not always preferable; yet it is through their sincere need to be seen, heard, and accepted, that the play speaks to all ages, for their quests are not confined to the young. 13 music and lyrics were written by Jason Robert Brown, based on a book by Dan Elish and Robert Horn. 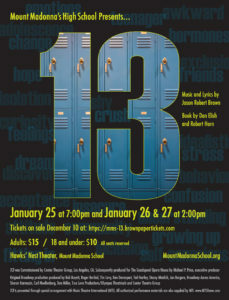 13 was commissioned by the Center Theater Group, Los Angeles, California, and subsequently produced for The Goodspeed Opera House by Michael P. Price, executive producer. The original Broadway production was produced by Bob Boyett, Roger Berlind, Tim Levy, Ken Davenport, Ted Hartley, Stacey Mindich, Jan Bergere, Broadway Across America, Sharon Karmazin, Carl Moellenberg, Tom Miller, True Love Productions/Olympus Theatricals and Center Theatre Group. 13 is presented through special arrangement with Music Theatre International (MTI). All authorized performance materials are also supplied by MTI. www.MTIShows.com. Producer’s note: This comedic and poignant production is rated PG by Musical Theater International. It includes crude humor, juvenile-type sexual innuendo and limited use of profanity. One of the characters is physically disabled with a fatal disease, and he frequently copes by poking humor at his health and mortality. This production has a powerful message of teens learning to make wise choices while dealing with peer pressure, using language favored by teenagers.